Facet browsing has become popular as a user friendly interface to data repositories. The Semantic Web raises new challenges due to the heterogeneous character of the data. First, users should be able to select and navigate through facets of resources of any type and to make selections based on properties of other, semantically related, types. Second, where traditional facet browsers require manual configuration of the software, a semantic web browser should be able to handle any RDFS dataset without any additional configuration. 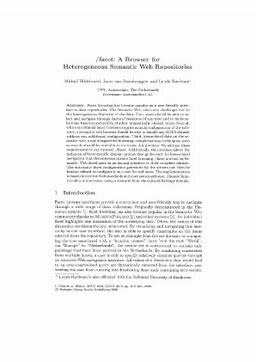 Third, hierarchical data on the semantic web is not designed for browsing: complementary techniques, such as search, should be available to overcome this problem. We address these requirements in our browser, /facet. Additionally, the interface allows the inclusion of facet-specific display options that go beyond the hierarchical navigation that characterizes current facet browsing. /facet is a tool for Semantic Web developers as an instant interface to their complete dataset. The automatic facet configuration generated by the system can then be further refined to configure it as a tool for end users. The implementation is based on current Web standards and open source software. The new functionality is motivated using a scenario from the cultural heritage domain. Hildebrand, M, van Ossenbruggen, J.R, & Hardman, L. (2006). /facet: A Browser for Heterogeneous Semantic Web Repositories. In The Semantic Web - ISWC 2006 (pp. 272–285). Springer-Verlag.